Microgaming are well known for producing large quantities of slots, possibly with the aim that if you produce enough some will prove a hit with players. Following that mantra with this slot title called Big Chef that focuses on life in a manic kitchen that roughly resembles the environment where Ratatouille the mouse learned his trade. 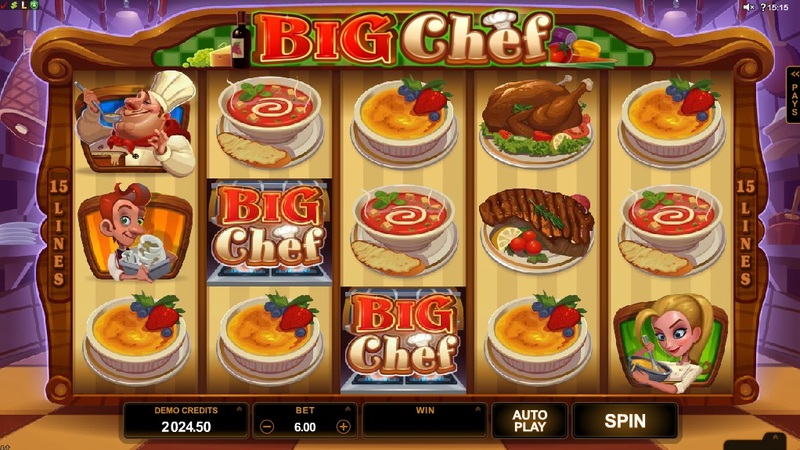 Big Chef is a 5 reel, 15 payline slot game from Microgaming that takes you into the stressful surroundings of a kitchen whilst giving you the chance to hit some big wins and have a bit of fun along the way. The reels are even set inside a menu board. The symbols present on the reels include a chef, a female chef, an older waiter, a younger dish washer, a crab meal, a steak meal, a roast chicken meal, soup, and a tart. It's refreshing to have unique symbols covering the reels and no generic regular 10-through-to-Ace symbols. This is a good start. The Wild symbol is present on the reels as the Big Chef logo icon. This symbol substitutes for all other symbols, except for the two Scatters, to complete any potential winning combinations that appear on the reels on each spin. You will be pleased to know that on this slot there are two Scatters that can both trigger free spins. The first is the blue menu Scatters. If you hit three or more of these across the reels then you will earn 10 free spins with a 2x multiplier. Want an Extra Free Spin? Secondly, there is the cloche Scatter symbol. You will need to hit this symbol on reel 5 during the base game in order to receive 1 extra free spin. It might not be 10 free spins but nobody can turn down a free spin when it's given to them so this second Scatter and its free spin opportunity is great to see. Big Chef also has the innovative Rising Wilds feature that triggers during the free spins. If you hit a Wild symbol it will expand to the position above on the same reel on the next spin whilst remaining in place on the previous position leaving a trail affect behind it. This means that you can end up hitting a lot of Wilds during the free spins which is pretty cool. There are not that many chef-themed slots out there. The 3D Mamma Mia slot from Betsoft Gaming and the Japanese-themed Sushi Express slot by Cryptologic are the two stand outs titles with a cuisine angle. 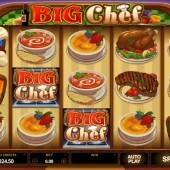 This Big Chef slot takes things to another level with its free spins and Rising Wilds. It's fantastic to see Wilds utilized in this fresh way and the slot really benefits from them. If you love your Wilds then you will want to get on this slot as soon as possible.